Diagraph is committed to providing valued business partners with a superior level of technical service and support well-beyond product implementation. We have designed our service programs to match the skill level of your maintenance team -- from on-going training so that you can maintain your own fleet all the way to kick back and relax, we will take it from here. Explore our current available programs below or contact us to have a program rightsized for your specific needs. Getting in touch with us has never been easier. Call our toll-free service and support telephone number at 1.800.722.1125, email us directly using service@diagraph.com or reach out to us through live chat during our normal business hours. We look forward to serving you. 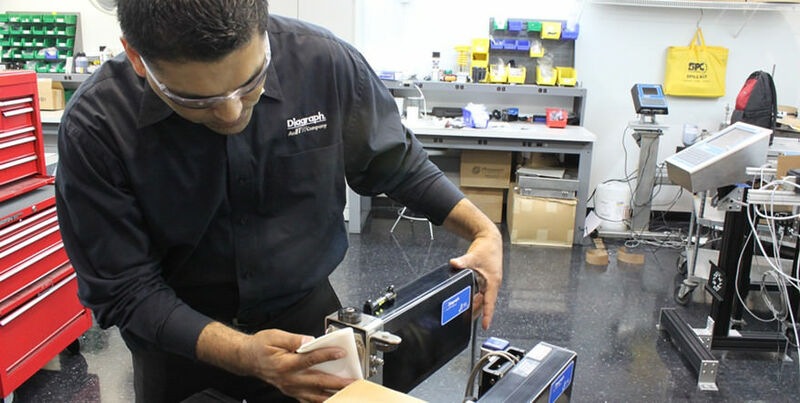 The Diagraph Service Repair Center offers on-site and in-house support for large character inkjet, high resolution inkjet, thermal transfer overprinter, and automated labeling systems. Learn more about our flexible preventative maintenance programs and service contracts designed for your marking and coding operation. Access to our Technical Help Desk is offered as a free service for our customers. Diagraph maintains a staff of highly trained support technicians who are available from 7:00AM to 5:00PM (CST) each business day to assist you and answer your equipment related questions. Technical phone support provides answers to questions ranging from part number inquiries to advanced trouble shooting assistance. Our Help Desk Technicians are ready to serve you when you call 1.800.722.1125 and are also available to answer your questions through live chat. For all times outside of our live Help Desk support hours of 7:00AM to 5:00PM (CST), Diagraph offers after hours phone support at 636.248.8070. The caller will be prompted to leave a voice message which should include the contact’s full name, company name, direct phone number (with area code and extension if applicable) and a brief description of the problem with model/type of the equipment. Diagraph maintains a national team of highly trained Field Service Technicians who are available for on-site repair or maintenance of your Diagraph and Linx systems. Our Field Service Technicians are certified annually to work on the full range of Diagraph systems and their vans are fully stocked with common repair parts and tools to provide you with rapid and efficient support. You can reach our central dispatch team to schedule a Diagraph Technician for a site visit by calling 1.800.722.1125. Diagraph offers a variety of courses on our large and small character inkjet systems, high resolution inkjet systems, and automated labeling systems. Our professional Technical Trainers conduct classes at our training facility located at Diagraph corporate headquarters near St. Louis, MO. Your investment in training pays dividends when your trained employee returns to your plant with fewer equipment problems, faster resolution to issues and immediate repair capability. The Diagraph technical training program focuses on the proven principle of hands-on instruction. For more information call the Diagraph Service Center at 1.800.722.1125 or email service@diagraph.com.